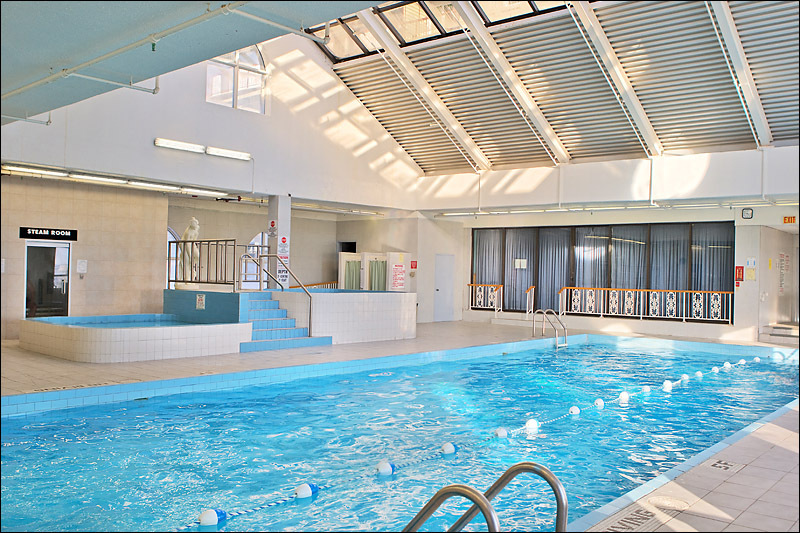 An 18 meter pool is available on-site at Physiotherapy Works! for supervised individual or group aquatic exercise therapy programs. The unique on-site access allows for easily supervised therapy programs. Aquatic Exercise Therapy is a comprehensive therapeutic approach using aquatic exercises designed to aid in the rehabilitation of serious injuries or conditions. The components include warm up, flexibility, strength endurance and cool down. One of the main advantages of aquatic exercise therapy is “weight relief.” Individuals exercising in the water feel lighter, move with more ease and feel less weight on their joints because of buoyancy. Benefits of Aquatic Exercise Therapy? Individuals deriving the greatest benefit are post surgical, orthopedic, and chronic pain patients. Any person who requires increasing or maintaining joint ranges of motion and functional strength would benefit. Water can be excellent environment for patients who have difficulty with weight bearing activities due to arthritis, recent fracture, sprain/strains, or excessive weight. By exercising in water, vasodilation of blood vessels occurs. This will increase blood flow to the injury site, which results in increased oxygen and nutrient delivery as well as waste product removal. All of which will promote the healing process. Another benefit of aquatic therapy is the added resistance that the patient experiences while in the pool for therapy. Air resistance is much less than water resistance, so patients in water use many more muscles and have stronger muscle contractions than they would by exercising on land. Other beneficial attributes associated with water physical therapy include, increased range of motion, improved balance and coordination, normalization of muscle tone, protection of joints during exercise, and reduction of stress. Contraindications to pool therapy are: fever or flu, cardiac failure, urinary infections, open wounds, infectious disease, contagious skin rashes, lack of bowel or bladder control or fear of water. NOTE: The pool is not wheelchair accessible. The client must walk up stairs to access the pool. Who would develop and supervise the program? Following an initial assessment, an Aquatic Exercise Therapeutic Program will be developed and supervised by one or a combination of the following: Stephanie Roberecki, B.M.R.P.T., Kelsi Abbott, B.M.R.P.T., Lindsay Morrish BKin., Sarah Kamstra, B.Kin, CSEP-CEP, Karen Malenchuk, B.M.R.P.T., and Julia Braaksma, CAT(C) according to the individual needs of the patient/client. The Aquatic Exercise Therapy Program may also be combined with a Reconditioning Program if indicated for specific rehabilitation candidates.